Winterkorn, aged 63, will head VW for several more years. BERLIN (Bloomberg) -- Volkswagen AG’s supervisory board plans to extend CEO Martin Winterkorn’s contract, said Bernd Osterloh, head of the carmaker’s works council. Winterkorn, who previously was the CEO of VW’s Audi luxury unit, took over as CEO Jan. 1, 2007, from Bernd Pischetsrieder. German CEO contracts typically run for a five-year period and a decision on an extension taken by the supervisory board about year before the contract’s end. Winterkorn, 63, has vowed to surpass Toyota Motor Corp. in sales and profitability by 2018. The CEO is targeting a pretax profit in 2018 that exceeds 8 percent of sales, compared with 1.4 percent in the first three quarters of 2009. VW, Europe’s largest automaker, increased first-half sales by 15 percent to more than 3.5 million cars and sport-utility vehicles worldwide. Sales of VW brand vehicles exceeded 2 million in the period. Volkswagen spokesman Michael Brendel said he couldn’t immediately comment. Winterkorn has the support of Lower Saxony, the German state with a 20 percent stake in the carmaker and the power to veto major decisions. 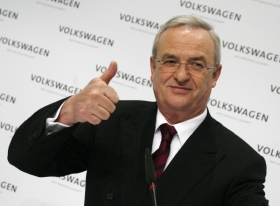 “We support Martin Winterkorn’s ambitious goal to make VW No. 1 in the auto market worldwide by 2018,” designated Prime Minister David McAllister told Bloomberg in a June interview. Volkswagen paid $2.5 billion for a stake in Suzuki Motor Corp. in January to expand in India and is taking over Porsche SE’s sports-car making operations, adding a 10th brand to VW’s marques that include Skoda, Seat and luxury brands Audi, Lamborghini and Bentley. VW is also building a factory in Tennessee to boost U.S. sales and plans to add a 10th plant in China to double production capacity in the world’s biggest auto market.